This is a refreshing and satiating smoothie featuring what I consider a delicacy. Young coconuts, also referred to as Thai coconuts, are not always easy to come by where I live and can be a bit pricey. Consider yourself lucky if young coconuts are native to where you live. When I do get my hands on this choice food I usually guzzle the coconut water immediately after opening. It’s full of electrolytes and very hydrating. Perfect after a run or workout. Several companies have recently brought bottled coconut water to the market. While some brands are no doubt healthy options, nothing compares to the real thing when it comes to nutrition and taste. Occasionally I show some self-restraint and pour the coconut water straight into my blender followed by the meat, which I scoop out with a spoon. Blending the water and meat results in a rich, flavorful coconut milk. Add a lemon and half an avocado and you have a delicious lemony coconut smoothie! This video demonstrates how to safely open a young coconut. The amount of meat you get will vary from coconut to coconut. Some don’t bear much at all while others a full cup. 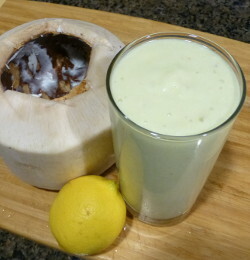 I’d love to know if you try this lemony coconut smoothie and how you liked it. Please leave a comment below. Happy Blending!